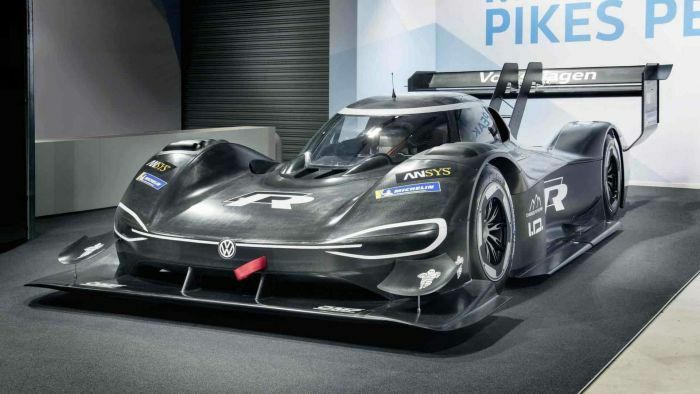 With less than two weeks until the Pikes Peak Hill Climb, VW gave a bit more in-depth information about the electric racer's dual electric motors. In about a week-and-a-half, we’ll know whether all of the work that Volkswagen Motorsports has put into its I.D. R Pikes Peak supercar achieved the automaker’s goal: setting a new record for the Pikes Peak Hill Climb. VW has invested plenty in making its goal. Though there are no figures, it’s a sure bet that lightweight I.D. R Pikes Peak electric supercar has required some heavyweight funding. If the automaker makes its goal, it will have beaten the current record set only two years ago by Rhys Millen at the wheel of an e0 PP100. The best time is 8:57.118. VW has been testing the I.D. R on the course for the last couple of weeks. To do its testing, the racer has been dressed up in its light gray livery and the number 94 A lightweight, the racer weights less than 2,425 pounds. Two electric motors power the racer, one for the front wheels and the other for the rear. Their combined output is enormous, 670 horsepower. The I.D. R Pikes Peak uses two integrated lithium-ion battery packs on either side of the one-seat cockpit. Romain Dumas, defending champion, has been taking part in the testing, according to the automaker. When the flag drops for his ride on June 24, it will jump onto the 12.42-mile course and instantly begin sizing up road conditions. A series of sensors, linked to the computer system, handles that chore as the wheels check road conditions. Recuperative braking takes the waste power and works it over so that it is put back into the battery system. Officially, the racer is part of the upcoming I.D. R family of electric vehicles – hatch, Crozz, Buzz, and Vizzion – the lessons learned in the race will be put to use as the new family comes to the roads in a couple of years. Here's a look at VW's developmental and current cars. While its ultimate contributions to the lineup won’t be known until the new family has significant numbers of vehicles on the road, the I.D. R Pikes Peak already has to do some heavy lifting as its 2.25 0 to 62 mph (100 kph) has been touted as faster than an F1 racer.